The annual Stephen Sondheim Society’s annual Student Performer of the Year competition culminates each year in a West End Gala, where young 12 finalists showcase their performance skills in front of an audience and a panel of esteemed judges. Previous finalists have included Taron Egerton, Cynthia Erivo and Alex Young, and so it’s evident that the finalists this year are destined to go on do amazing things. The competition runs alongside the Stiles and Drewe Prize for new musical theatre writing, which supports new musical theatre through a prize for Best New Song, and a Mentorship Award which sees one new musical receive mentorship for a year, culminating in an industry showcase. As was to be expected, the event proved to be a fabulous few hours, celebrating the best upcoming talent in musical theatre performing and writing. The performer of the year competition was jam-packed with undoubtedly some of the most promising new faces in musical theatre, with the standard of performances extremely high across the board. Although there could be only one overall winner, each finalist performed with virtuosity, mastering the complexities of the music and providing fresh new interpretations of some of Sondheim’s most beloved songs, as well as some of his lesser known pieces. After almost 3 hours of competing, the winner of the Student Performer of the Year competition was awarded to Arts Ed student Alex Cardall, who performed the marathon-like Buddy’s Blues from Company with ease, and wowed with his understated performance of You and Me by Adam Wachter. Wachter’s touching song about unrequited love was also awarded the Stiles and Drewe Prize for Best New Song, a testament to both the outstanding writing and performing on display. Second prize was awarded to James Stirling, who was utterly commanding and transformative as the Wolf from Sondheim’s Into The Woods, singing the gloriously creepy Hello Little Girl. 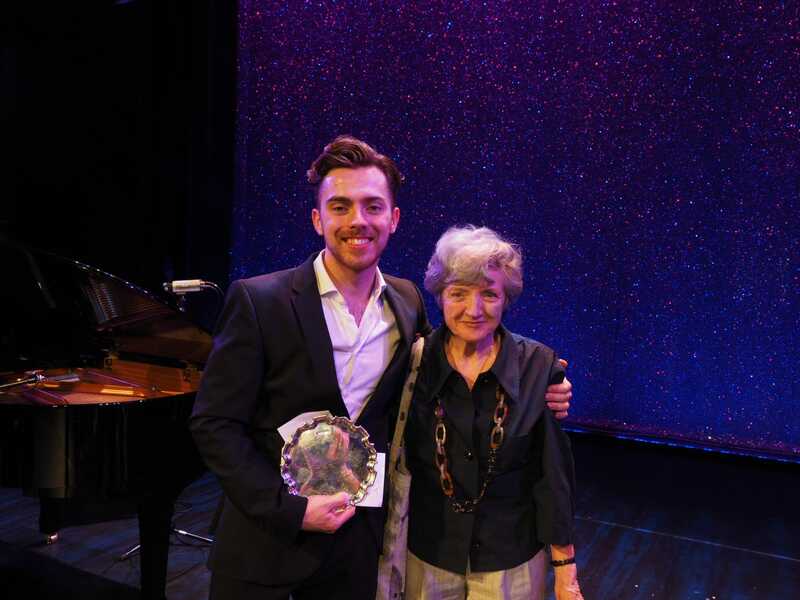 Meanwhile Stephen Sondheim Society Patron Julia McKenzie donated a third prize to performer Shelby Flannery for her rendition of I Wish I Could Forget You from Passion. Other highlights of the competition included Will Carey, who opened the competition with Giants In The Sky from Into The Woods. Although the song is one of Sondheim’s most recognisable, Carey mastered the storytelling, making his interpretation exceptionally memorable. His second performance was equally impressive, as he tackled a new rock musical song, Everything Will be Alright by China Doll, Roxanne Lamendola, Leah Fogo and Scott Stait. Additionally, Thomas Grant’s performance of the tongue twisting song Franklin Shephard Inc. from Merrily We Roll Along was a treat. Coming towards the end of the showcase, it provided a few laughs and a chance for Grant to showcase some brilliant character acting. Meanwhile, Amara Okereke, soon to be seen as Cosette in Les Miserables on the West End, performed a Not A Day Goes By from Merrily We Roll Along gorgeously, and was magnetic in her second song, Shone With The Sun by Benjamin Till, Nathan Taylor & Sir Arnold Wesker. Bonnie Baddoo's Ladies Who Lunch from Company was yet another highlight in amongst the exemplary selection. In addition to Alex Cardall and Adam Wachter’s wins, Kit Buchan and Jim Barne’s The Season was awarded the Mentorship Award, and will no doubt be a musical to keep an eye as it develops over the coming years. This year’s Stephen Sondheim Society Student Performer of the Year and Stiles and Drewe Prize was a remarkable showcase for some of the most exciting up and coming musical theatre talent, and it will be thrilling to see where all of the finalists end up over the next few years.